A pristine sanctuary on the outskirts of Ranthambore National Park, each of Aman-i-Khás' spacious six-metre canopies overlook ruggedly beautiful views of the landscape without compromising on privacy. Inspired by the airy abodes of Mughal emperors, the ten tents are arranged around a communal fireplace, raised on concrete plinths and draped in cotton to separate sleeping, dress, and bathing quarters. Let Aman-i-Khás' wildlife experts guide you through the untouched jungles, where you can discover tigers, crocodiles, leopards, jackals, deers and other wildlife in their habitats. You can also embark on camel safaris through villages on the outskirts, or bird-watching treks in the lush Banas riverbed. Ranthambore National Park is home to Ranthambore Fort, a UNESCO World Heritage Site which boasts ancient temples from the 12th and 13th centuries. The grand and dramatic ruins of the nearby Khandar Fort are also a must-see. Tatler Tip: The best time to visit Rajasthan is pre- and post-monsoon, from April to June in summer and from October to November in autumn, when days and nights are mild. The weather can get pretty hot in May, however. A pine forest blanketed in snow, an icy lake, and a spectacular display of lights against the Milky Way—Aurora Safari Camp in Sweden, is nothing short of magical. Even the journey to it is an experience to remember—glampers are taken on a reindeer hide-clad sleigh bench behind a snow-mobile across the frozen lake to the camp. The creation of famed Swedish photographer Fredrik Broman, every view from the African style tented camp is picturesque. Perfect for travellers chasing the Aurora Borealis, the camp is located away from the glare of light pollution so you can admire the Northern Lights in its beauty—Broman will even share tips to capture the incredible sights. The private camp features 3 Lavvu rooms, safari-style tents that can be rearranged into double, twin or family rooms. A firewood heater in each Lavvu keeps you warm even at -37 celsius. The lounge features a fireplace where guests can sip on warmed lingonberry juice, or host a dinner for up to 14. A sauna is also available, on a float frozen into the ice of the river. If you prefer to take in the magnificent views, warm your hands by the open fireplace, surrounded by friends and family under the stars. Tatler Tip: The months between November to May are the best for visiting Aurora Safari Camp, where there is abundant snow for husky-sledding, snow-shoeing, and snowmobiling. If you are thinking of catching the Northern Lights, you will have the most luck between November and March. Have a thirst for thrills but a taste for the luxury? Belmond Eagle Island Lodge's tented suites will suit your fancy. Surrounded by the lush safari of Botswana, get upclose to nature, without compromising on your creature comforts. The surrounding plains boast a wealth of flora and fauna—elephants, buffalos, hippos, crocodiles, and big cats are amongst the many residents—waiting to be explored on a horseback, canoe and even helicopter. Other activities include trekking, village visits, bird-watching and fishing. When it comes to design, sophistication and refinement are at the top of the agenda, with 12 air-conditioned tented rooms outfitted with plush oversized beds, en-suite bathrooms, walk-in dressing rooms and even plunge pools. The interior adopts a palette of muted blues and copper, a nod to the region’s mining history. What better way to get away from it all than to an unspoiled savannah with life’s finest indulgences? Tatler Tip: Don't miss the stunning Botswanan sunset from the lodge's cosy Fish-Eagle Bar, between 5 to 7:30pm everyday. 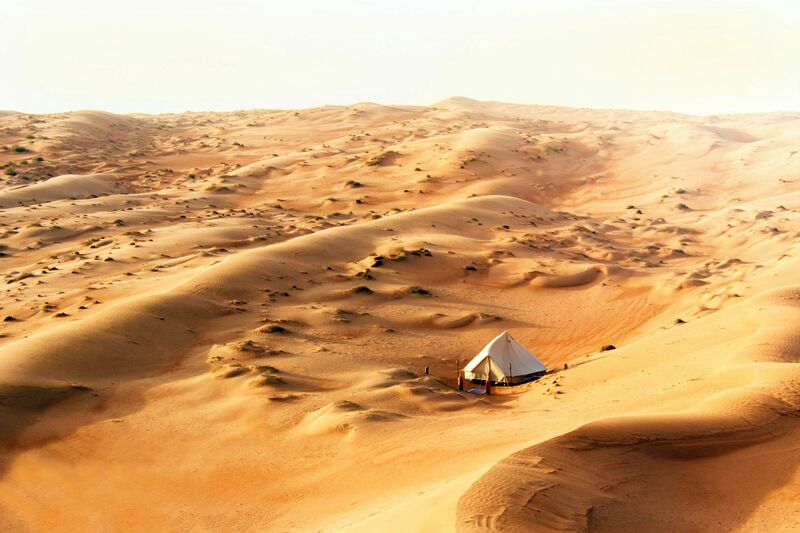 1001 Arabian Nights come to live at Canvas Club, a luxurious private camp in the golden dunes of Wahiba Sands. Off the beaten path and in the middle of the pristine deserts—you will arrive at the camp by camel—Canvas Club is the picture of a Middle Eastern dream. Each traditional Bedouin tent, which can accommodate two adults and two children are furnished with comfortable beds and tastefully decorated with ornate rugs, cushions, and colourful lanterns. A separate bathroom tent offers the luxury of hot water showers and a foot-pumped wash basin. Start your day to the beautiful Oman sunrise and the aroma of freshly baked Omani bread, and explore the vicinity with your private driver and guide by jeep. Visit the Al Hayer falls of Wadi Bani Khalid, where you can take a dip in its crystalline waters and explore cave complexes. If you are feeling adventurous, ask the drivers to show off their dune bashing skills, or embark on a camel ride. By the night, enjoy uninterrupted views of the starry skies as you feast on a meal specially prepared by your private chef by the candlelight. Tatler Tip: Canvas Club is perfect for a night’s stay or two as you travel through Oman. While temperatures are generally warm, the summer months of Oman between June and August can sweltering and uncomfortable. For the best weather, visit between October and April. Joining the ranks of luxury glamping destinations is Capella Ubud, which opened in June this year. The four-hectare resort sets up camp between the lush Ubud rainforests and picturesque rice paddies of Keliki village. The work of Bangkok-based architect and hotel designer Bill Bensley, the 22 Dutch-style one- and two-bedroom tents are inspired by early European settlers of the 1800s, celebrating their spirit of adventure and the nostalgia of Bali's exotic past. This is balanced with modern-day comforts—each tented air-conditioned retreat comes with a private salt water Jacuzzi, indoor and outdoor bathrooms, large outdoor decks, a smart phone, and an Illy espresso machine. The retreat also boasts the award-winning Auriga Wellness spa on-site. Take a trip to the sacred Wos River, where villagers gather for festive processions, visit the splendid Hindu temples, and don't miss the Puri Lukisan Museum—Bali's oldest art museum. For the unique glamping experience, sit by the campfire over hot chocolate and toasted marshmallows as local storytellers recall tales of Bali's past. Tatler Tip: Feed your sense of adventure with activities like nocturnal jungle and rice paddy trekking, jungle boot camps, mud Pilates and mountain bike ridge rides. Is there a better way to reconnect with nature than taking a hike and sleeping under the stars? A trip to EcoCamp Patagonia gives you just that—while ensuring that no damage is done to the environment. Setting up camp in the heart of Torres del Paine National Park in Chile, the fully sustainable hotel is the first of its kind in the region, boasting 13 geodesic domes that run on solar and hydraulic energy, and feature composting toilets. While electricity is limited, luxury is not overlooked—the cozy dome tents house a king-size or two twin beds, with an open terrace, a wood-burning stove, an enclosed porch, and a fully-equipped bathroom. Around the site, indulge in some introspection in the Yoga Dome, bond with new acquaintances over a drink at the Bar Dome, and enjoy hearty meals—some prepared by yourself—at the Community Domes. But with so much to take in at the eco-rustic paradise, you’ll find yourself out and about most of the time. Each booking at EcoCamp Patagonia signs you up for an itinerary across Patagonia, whether you have a preference for animal-watching at the safari, or a taste for adrenaline-pumping adventure. You’ll be refreshed and reinvigorated when it is time to return to the city. Tatler Tip: If adventure sports are your motivation, visit Patagonia in the warmer months of November to March, where you can participate in kayaking, mountain biking, horse riding and hiking. It is also the best period to see penguins by boat in the Strait of Magellan. Camping is meant to be an exercise in simplicity, and while Hoshinoya Fuji retains this spirit, it raises it to a whole new level. The difference is noticeable even before one steps foot on the property. Located on a slope facing Lake Kawaguchi—one of the five lakes with prized views of Mount Fuji—the white box-shaped hotel juts out from the dense red pine forest, begging to be noticed. The sleek lines of the building are echoed in the minimalist interiors of the rooms. Devoid of unnecessary ornamentation, the rooms place the landscape of of Mount Fuji front and centre. The clever addition of an outdoor area, equipped with a modern fireplace and fitted with a kotatsu (heated table), emphasise a strong cultural touch that showcases glamping with a Japanese twist. Greet the day with a Japanese bento breakfast or cap the night by enjoying a dram of the local whisky. Elsewhere in the property, the severe lines and stark whites are replaced by a more homespun character. This is most evident in the Cloud Forest, where the simple joys of camping in a forest are brought to life—from enjoying the sounds of the wild to roasting marshmallows on an open fire. This being a Hoshinoya property, of course, luxury is all but expected... so you can opt to watch an outdoor movie while sipping a glass of rare Hibiki. Tatler Tip: While each and every room has an unbeatable vantage point to take in Mount Fuji, its famous snow cap can be difficult to see during the summer months. Try visiting during the cooler seasons, from November to May. Instead of lounging the weekend away at a beach resort, why not pack your bags and move into a beach-side safari camp, where all the action happens? Nestled in the dune of Cape Range National Park, just metres away from the beautiful Ningaloo Reef, Sal Salis is the place for glampers who enjoy the sand, sea and the expansive species of marine creatures and native critters that Western Australia has to offer. Sitting on raised platforms on the sandy coast, each of the nine spacious wilderness tents feature comfortable handmade jarrah beds and cotton sheets, with an eco-en suite bathroom using a hand-pumped shower. Power at the camp is solar generated and there is no wifi or mobile reception, so there’s no better time to go off the grid and live in the now. Wake up to the song of birds and sip on your morning coffee as you watch humpback whales breach beyond the reef. Activities at Sal Salis include snorkeling, swimming with the whale sharks and humpback whales, kayaking, fishing, and guides walks along the gorges where you will find wallabies, emus, as well as unique flora and fauna. Tatler Tip: While the weather is good all year with little rainfall, April to October is the best time to visit for comfortable temperatures. If you are looking to swim with the whale sharks however, plan your trip between April and June. Wild Coast Tented Lodge isn’t one for grand entrances, nor does it desire to stand out. It aims to blend in, which is no surprise given its location at the edge of Sri Lanka’s Yala National Park. Upon arrival, one is greeted by a humble hut set in verdant surrounds, which immediately reminds guests that they’re in the thick of a tropical forest bordered by the pulsing Indian Ocean. From the use of local materials such as stone and mud brick to the rounded forms that dominate the structures, almost every element references the lodge’s extraordinary location. Each of the 36 tents were designed to resemble the cream-coloured boulders on the shore and were positioned around a watering hole, meant to draw the wildlife in for closer inspection. In fact, the layout of the tents is crafted to mimic a leopard’s paw, which honours the revered residents of Yala National Park—the Sri Lankan leopard. Unique to Wild Coast Tented Lodge, the cocoon tents pique one’s curiosity at first sight. The tents feature large picture windows that frame the flora and fauna; the nautical-inspired portholes also add to the retro charm. Dominated by warm wood and an earthy palette, they’re clearly designed to be cosy, but not devoid of grandeur—the hammered copper tub is a truly decadent touch. Some cocoons are equipped with a terrace and a plunge pool, which, if you’re lucky, might net you a visit by the local elephants, which occasionally use it as their drinking fountain. Tatler Tip: Yala National Park usually closes in September and October each year. While the lodge will still be open available for occupancy, game drives will take place in adjacent parks instead. A mysterious walled retreat at the foothills of the Atlas mountains in Morocco, Kasbah Tamadot is one of Virgin Limited Edition's luxury resorts, a collection by Sir Richard Branson. Embracing the rich heritage and culture of Morocco, the resort's 28 bedroom and suites are individually outfitted in traditional Moroccan furnishings juxtaposed with contemporary design as well as antiques and unique artefacts from around the world, thanks to the property's former owner and renowned antiques dealer, Luciano Tempo. Featuring ten luxury Berber tents—hidden beyond the herb gardens—there is a nomadic quality about Kasbah Tamadot that draws travellers in. Staff are locals who reside in the surrounding villages, giving the experience a sense of authenticity and homeliness. Beyond the walls, an exotic Moroccan adventure awaits, from mule rides in the mountains to hot air balloon rides over Marrakech. Otherwise, take it from Sir Branson himself, who loves a good hike up the Atlas mountains during his stays. Tatler Tip: Don't leave without trying the traditional Moroccan Hammam at the Asounfou Spa, a full body cleansing ritual which will rejuvenate your skin and relax your mind and body.